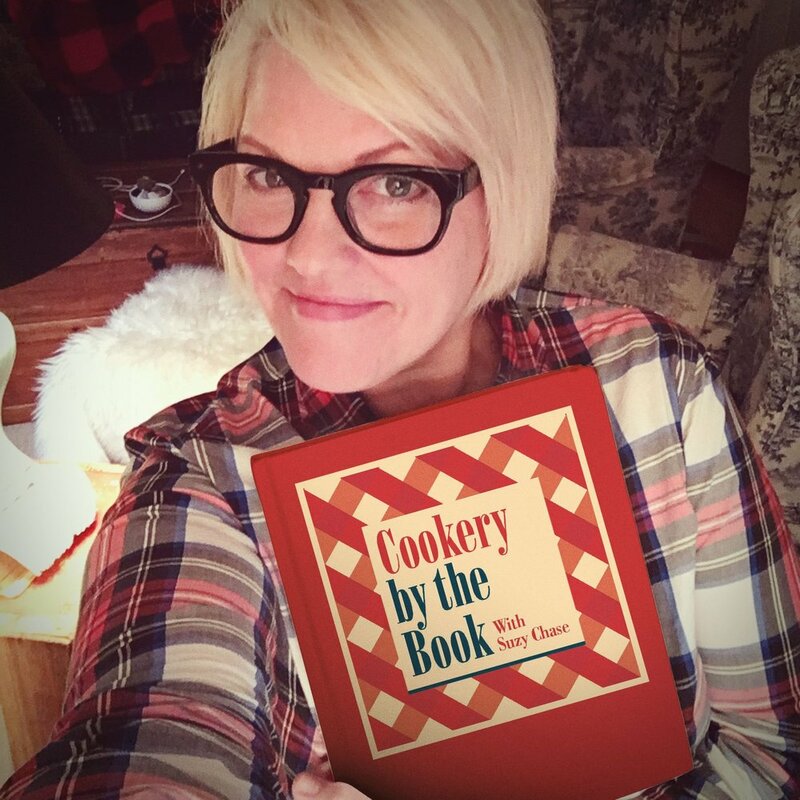 Suzy Chase: Welcome to the Cookery By The Book podcast with me Suzy Chase. Jessie: Hi. I am Jesse Sheehan and I have written a cook book called The Vintage Baker that I am very, very excited to talk to Suzy about. Suzy Chase: Your vintage baking booklet collection inspired you as you wrote this cookbook. Tell us a little bit about your collection. Jessie: Sure. So it was over ten years ago that I first discovered these booklets. I'm actually a former lawyer which I kind of try to keep a secret, but I'm just gonna come right out and tell everyone right now and I was on this extended, I joke, this extended maternity leave whereby I had left to have one child and then I left to have another child and then I never went back. So I sort of had my kid, left my law firm and never returned and after my second child was about a year old I loved being at home with my kids but I also didn't love being at home with my kids and wanted to find something to do that would take me outside of the home and I didn't want to go back to being a lawyer and I had started working as a junior baker in a bakery in Red Hook Brooklyn where I live called Baked. I had sort of just walked in the door and said, "Please hire me. I don't really know anything, but I will be a hard worker and I really want to learn what you guys are doing here," they of course looked at me like I was a crazy person, because what kind of mom does that or person of a mom's age does that, but long story short, they took me in as an intern. I started baking with them and it was around that same time that I was with ... One of my kids was, I don't know, in an art class somewhere and I was strolling around Cobble Hill with another one of my kids and stumbled, or Carroll Gardens and stumbled upon this junk shop that had all these amazing booklets in this barrel, not barrel, but basket on the floor of the shop and I zoomed in with the stroller and grabbed a bunch of them. They have these incredible covers with cakes on them and ice cream and candy and the illustrations are just so whimsical and at least for me very kind of provocative and exciting. I grabbed a bunch of these booklets and took them home and the rest was history. I started working with the booklets just at home, making things from them. Being inspired by them while still working at Baked and learning the craft of baking as it were. The booklets are special. Their recipes tend to be ... They're not the most ... It's funny I was just listening to your podcast with the woman from Betty Crocker and that new cookbook. Jessie: And she was talking about how you really have to change the flavors of these old recipes for our 21st century palette and that is absolutely true. What I would find ... What I loved about the recipes is they're full proof. They've been tested. They really are tried and true, but they may not have the kind of pizzazz that you want them to have. So I think she mentioned this, and I'll mention this, like almost no recipes call for salt. She mentioned things being too salty. I actually never found anything to be too salty. Although she was talking about savory and I'm talking about sweet, but 90% of the recipes don't even call for a little bit of salt as we all know a little bit of, not that we all know, but a little bit of salt will help bring out other flavors, so you kind of need salt not to make something salty but to make something flavorful in general. So things like that, or even vanilla. I wrote a book called Icebox Cakes before I wrote this book and I was able to pitch this idea about booklets to my editor who worked with me on Icebox Cakes and she loved it. So it was that's maybe too long winded an answer, but that's where booklets came to be part of a book. Suzy Chase: It's never too long winded. Suzy Chase: So what years were these booklets put out and who put them out? Jessie: So, sure, so they ranged or at least the ones in my cookbook, the one's that I'm using are from the late 19th century like the 1890's though, I think I have a McCall's booklet in there from the 1970's, but I would say mostly the heyday of the booklets would be like the 20's, 30's, 40's, and 50's. Essentially ingredient companies like Domino Sugar or Swans Down Cake Flour, or appliance companies like Frigidaire would distribute these booklets when a customer bought a bag of sugar or bought a refrigerator and the booklet's called for the ingredient or the appliance being purchased in all of the recipes. So obviously with the Frigidaire book, every single thing was gonna be something that you needed to make cold, whether it was ice cream or some kind of pie. Then if it was Swans Down Cake Flour, everything in there calls for Swans Down Cake Flour and the booklets were and amazing advertising tool. They encouraged the women to use the product. They, depending on the era in which the booklet was published, kind of the message to the homemaker as it were, would differ, for instance during the depression the message would be let's talk about how frugal you can be. You can use our product and you can make these things and you're gonna save money in the 20's earlier on there was a, I forget the exact date, but there was a pure food health law passed. I'm bastardizing the name, but something like that. During that period of time, all the recipes were supposed be good for you. So it would be like you must buy this kind of Knox gelatin because it's gonna make sure that you never get a cold or that you have strong bones or whatever it is. Then in the 1950's, which I just love, it was all about, I mean very sexist, but I love it anyway, just all about the glamour associated with cooking. So suddenly cooking went from something that your chubby granny was doing with an apron on, like to be frugal in the 20's. They were just the most wonderful names for different treats. For instance like the sea foam ... the seven minute frosting in my book is made with brown sugar and called sea foam frosting 'cause that's what it was called back in the day and I just adore that or fig newtons were called fig pincushions or almond cookies that kind looked like a sand dollar. You place three small slivered almonds on the top of the cookie, those are called sand tarts. So I was just in love with the names and so chose some recipes in the book because of the names that they were given in the booklets and some because I love them and some because they were just so ubiquitous and you just felt like I can't really write a cookbook based on these booklets unless I put in a coffee cake because every booklet has a coffee cake. Jessie: Oh I know. That's a great one. So in my book they're called pecan curls 'cause that's what they were called, but yes they had a variety of different names and it's just again it's just so ... I found that really fun and special just to see how creative and different what the stapes, not staples, but the things that we love to eat. These baked goods that we love to eat. All the derivations of their different names. Suzy Chase: And they were called curly Q's, isn't that cute? Jessie: Yes. It makes so much sense right? Because that's the shape. Jessie: We just called them buns, but really there should be some reference to the way you make the dough and how you roll up the log and it is a curly Q.
Suzy Chase: Yeah. They're so not a bun. Jessie: I know right? True. It's true. Suzy Chase: When did you realize that you had a passion for recipe development? Jessie: Oh good question. I would say what purchasing all those booklets early on brought me was not only this exciting connection between the more modern version of these old school desserts that I was learning to make at Baked, but also my own efforts at home to kind of twist and tweak the recipes myself and I almost feel like doing that at home encouraged me to think about development in a whole different way. I was so committed to just learning how to do things. I'm a rule follower and I kind of, which is probably why I like to bake, I don' mind if you don't have to ... I'm not one of those people that always wants to, "shake it up" and put my own label on it. I'm like, what, here's a recipe I'm gonna follow it. Anyway, working at home with the booklets definitly inspired me to play around a bit more and then what was amazing about the opportunities that I ended up having at Baked, at the bakery is that Matt and Renato who own the bakery and are the founders began writing their own cookbooks and they needed a home baker to test their recipes, 'cause they wanted to make sure the recipes worked in a home kitchen and everyone I worked with was a true on professional, who'd gone to cooking school. So I was a perfect person to test the recipes. Then from testing, I started developing recipes for their books. So definitly it was my work with them and the bakery that gave me my first opportunities to do so, but that was sort of coupled with my own kind of experimentation at home. Suzy Chase: I love that you referenced the 1942 booklet, My Bananas, How To Serve Them on the chi banana fritter page. Suzy Chase: In that booklet, it recommends serving banana fritters for dinner with roast beef and cauliflower. Suzy Chase: I mean that's hilarious. Jessie: Yeah. That was really fun too. I didn't spend, it's funny, I definitly brought that up in that head note to that recipe, but there was crazy things they wanted you to do with some of these sweets and particularly the jello booklet. I had this amazing recipe that was actually cut. By the time it's time to put the whole book together often you have to cut a few recipes to make everything fit once design gets involved in how it's gonna look, but I had a recipe for whipped jello, which is actually this amazing concoction of jello that you end up before it's really hard, it's just starting to set up, you add a lot of whipped cream to it and whip it up and it's almost like this delicious fruity mousse. I fell in love with the name whipped Jello. I saw it everywhere. I have a lot of jello booklets and so I saw it in all of my booklets and I was like this is absolutely going in my book and then I did my twist and tweak for that recipe 'cause all the recipes in the book are, I say I twisted and tweaked them for the 21st century baker. The twist and tweak was that you just make the jello from scratch. You just are buying gelatin and I had ... The recipe was a passion fruit whipped jello and you bought passion fruit juice and gelatin and it was this amazingly light fruity deliciousness, but I forgot why I went ... Oh, I know why I went on that tangent. But the jello booklets are an amazing example of things like this banana booklet where you're like, "Huh, you want me to serve jello with what?" We think of jello as a sweet thing that maybe we had for dessert in elementary school in school lunch. Do you know what I mean? Not something that you're serving as a main course as it were. The jello booklets are just, not go off on a little riff on the, are just some of the most extraordinary. There's one maybe from the 1920's which is literally like a story. On the first page a woman marries her young husband and is very fearful about the first meal she's going to make for her in laws and but jello saves the day, because she makes them jello and then her husband calls her at 6:00 pm and says, "I'm bringing folks home from the office. Is that okay?" And she panics, but then she makes them jello and it literally takes you through the milestones of this woman's life. Dinner party with the husband's friends from work, the in laws, the baby comes, the baby's first birthday, you know all the ways up until she's having tea and she's a granny and every occasion is marked with jello and I just think that is like beyond amazing. I love that booklet so much. Suzy Chase: Here's a clever piece of vintage advise. For even browning and less browning, bake your cookies on the back side of a rimmed baking sheet. Why is this? Jessie: OH, the idea is for the ... It's better ... What do they call it? It's almost ventilation for the cookies as they bake. They're not being encumbered by any little walls of the sheet and if they're baked up a little bit higher with the heat being able to go up underneath the pan as it were, it just makes for this terribly crispy deliciously baked, or perfectly baked shall we say, cookie. It was the advice you could get from the booklets. It's funny, when I first started writing the book, I thought that was gonna be ... When you write a cookbook, and you know how you have a [inaudible 00:15:33] and you're trying to get an editor or a publisher to buy your idea essentially, you try to have ... they want you to have a hook. What's the ... You couldn't just say, "OH I want ... I have these booklets I'm gonna write recipes from them." That's not enough. At first, I thought my hook was gonna be all the advice from the booklets. In the end it seemed like either a combo of other people putting old school advice in books or just not really ... I wasn't really sure it would be robust enough. That I would come up with enough advice to really make that move the book forward as it were, but I still held onto the idea, and my editor did, of just putting one little piece of advice before each chapter. Suzy Chase: You have included a darling pamphlet inside the cookbook. Tell us about that. Jessie: Sure. Well I wish I could take credit for it, but really that was Chronicle Books is my publisher and they're amazing and they make the most beautiful books and it was they're idea. I don't know if it was my editor, just with her colleagues discussing the book, but it literally, for those that don't know about these little booklets, they're four by six, I mean they vary in size, but they're pretty tiny. They're made of paper. There's no cardboard. They're stapled and what Chronicle has done, is placed a little tiny faux book into the pages of the cookbook. What is sort of both cool and made writhing the book or designing the book somewhat difficult is that ... So for instance, in this booklet, all of the recipes are pre 1923 recipes and therefore are not copyrighted. So what we put in the booklet, which is sort of amazing I think it's at least 20 if not more, recipes, original recipes, so you can sort of go look at my butterscotch pecan curl recipe and then look in the booklet to see what an original sticky bun recipe would have looked like. Same thing with the sand tarts, the almond cookie. I think I put the chocolate cake in there. So what's nice about the booklet is you can see the original and then you can see what I did and not every recipe in the tiny booklet is the one that I used to create the recipe in my book, but you get a sense of what an early recipe for one of these items would have looked like. The issue is this, post 1923, all of the art work and all of the recipes are copyrighted. Now I didn't need recipes for my book because I was creating my own, but I definitely needed to use the artwork from the booklets to really make the book special and back to this idea of finding your hook when you're trying to come up with a book proposal. The hook was going to be that I was gonna have original art from the booklets contrasting with more modern art by a contemporary photographer. So that was part of the process of writing this book and a laborious part of the process was contacting all of the companies and trying to track down who owned the booklets and who owned, or who owned the copyrights to these booklets now. Jessie: Yeah, I love Chronicle, but they did not offer to help me with that. So that was my job and it was really hard. Some of them like Kraft actually now owns all, like so, so, so many of my booklets, or knows the copyright to them because Kraft folded in General Foods and all of these other big, big companies that had produced so many of the booklets that I was interested in. Right before my manuscript was due, Kraft said, "Yeah, you can use our booklets," and that was an incredible coo. It was early on in the writing process, most of the art was pre 1923 because it was the only art that I knew I could use without permission. So I was so excited to be able to use art form all of the different decades so that it didn't seem like, "okay, this is really cool, she has ... this is all recipes from before." Before the 1920's. But anyway the booklet is super special and sweet and cute and can be used. I mean you could try to make recipes form it if you so desired. But it's just a nice contrast to the revamped recipes throughout the books well as they use the old fashioned font in it and then the pictures and it just gives a real sense of what an early book looks like. Suzy Chase: Now how has Bonny Slotnick of Bonnie Slotnick Cookbooks here in New York City helped you add to your recipe booklet collection. Jessie: Oh my gosh. How has she not helped me? I mean she's incredible. So I kind of knew Bonnie a little bit anyway. I had certainly been to her shop before I started writing this book, but at least it would've been three years ago. 2015 when my book Icebox Cakes came out. I started going to her shop and really embellishing or ... I started buying a lot more booklets. I had a few. I had some from when I had found them in that shop with my son all those years ago and I had certainly been collecting them over the years since then, but once I really got this idea to write the book, I ended up purchasing more books from her and she is such an extraordinary human being and she lent me many of her booklets. So ones that I didn't have that maybe are impossible to find at this point, she let me use. So I was about to photograph them as well as use recipes from them and that was huge, huge, huge and she's just an incredible resource. She knows so much about food history. She loves the booklets. That's why she has this vast collection in her apartment. We had this really fun day. She joked. It was like we were playing with Barbie's except we were playing with booklets and I came over and we sat on the floor and looked through her booklets and she let me borrow as many as I wanted which was incredible. I hope to do something in her shop in the fall. A little book signing and chat and she's so knowledgeable. She could probably ... She'll be teaching me and talking to everyone and I'll be listening, but she's amazing. Suzy Chase: I live for a good icebox cake, so I made your recipe for coconut chocolate icebox cake with toasted almonds on page 131. Suzy Chase: That definitely took me back. First off, describe what an icebox cake is. Jessie: Oh sure. So an icebox cake is a cake that consists of layers of usually cookies and whipped cream, but it could be lady fingers and pudding or it could be graham crackers and pudding and you layer these items in a dish and then place the dish in the refrigerator to set up as opposed to in the oven and what happens in the refrigerator over an 8 to 16 hour period of time is that the cookie, or the graham cracker, or the lady finger absorbs, I call it the cakey component, absorbs the whipped cream or the pudding and so what happens is the whole cake is transformed into this very creamy, still with some texture from that cakey component, but it's not crisp anymore. It's soft. It's transformed into this soft delightful creamy, yet slightly, I wouldn't say crunchy, but you know ... It's almost like cake, literally. Like you can imagine what it feels like to put your fork into a slice of really yummy chocolate devils food cake that those chocolate cookies when they've absorbed the whipped cream, become cake like. I think they are, obviously since I co wrote a book about them, I adore them and always have. I didn't grow up in a house where anyone was making icebox cakes, so I can't even really recall when I had my first one, but once I figured out that that was an option and this was something you could make on the regular because they're incredibly easy, I was all over it. The book that I wrote is all about using homemade ingredients. So you make your own cookies, you make your own graham crackers, you make your own lady fingers, pudding, whipped cream, as well as other interesting components, like a layer of caramel, or a layer of ganache. So the book requires a lot of the reader, although I hope that people get it that you can always substitute. Store bought lemon cookies. You don't have to make your own lemon cookie, or store bought lady finger, or even Jello pudding. Make a pudding out of a box if you don't want to do it on the stove top. So I hope the book will have some legs for people that are like, "Hmm, that sounds yummy, but I don't think I want to do all that work." I hope people will understand that when using that book, they can use things they find in the grocery store. So when I wrote The Vintage Baker I was very conscious of that. I love icebox cake so I put two recipes for icebox cakes. I have a vanilla rhubarb icebox cake and then I have the coconut chocolate one you mentioned. I made sure that, yeah they took a little bit of work, the vanilla rhubarb, you make a rhubarb compote on the stove top or the coconut almond icebox cake, you make this really fun coconut whipped cream from a can of coconut milk combined with some heavy cream. There's a little bit of actual, oh not actual work. There's a DIY aspect to it, but I'm not asking you to make any cookies. I'm asking you to buy some chocolate cookies for the coconut chocolate cake and I'm asking you to buy some vanilla wafers for the vanilla rhubarb cake. I just think that makes it more accessible for people. I think people hear icebox cake and they think that that's gonna be something easy that I throw together and stick in the fridge. That's what I wanted it to be in this particular book. I'm so glad that you made that recipe. Again back to my ... I have a lot of anxiety about putting this book out in the world. I'm very excited, but I'm also nervous 'cause it's like ... It's funny I was just listening to Deb Perelman who is a friend of mine and someone I've worked with. I was listening to her on Serious Eats and she was, "This is Deb Perelman," like incredible blogger, and cookbook writer and et cetera, et cetera, talking about the fear of when her second book came out. Like not sure it would have legs, or what would happen to it. Suzy Chase: Turn 'em over. Jessie: Until the fat, yeah, and you turn 'em over. The fat hardens ideally and in 24 hours you take the cans out, you open them, you scrape out the fat, you put the watery milk to the side, use it for another purpose, and then that's what you whip. I call for whipping it along with some heavy cream. It just makes it a little more stabile, but the first tester of this recipe tested it, fine, loved it, everything was perfect. Second tester, she got bum cans of coconut milk and despite the fact she'd left them in the refrigerator for a day, when she opened them it was all water and she tried to make it any ... I mean, oh I won't even bore you with the details, but that's why I have a little note in the recipe, like when you're in the grocery store, please pick up the can of coconut milk and just shake it slightly. You need to hear something that sounds slightly solid to begin with, 'cause if it's all watery when you get it at the grocery store, it ain't gonna change once it hits your refrigerator. Talk to me Suzy, did you have any problems with that? Suzy Chase: No, well with the coconut milk, no. Suzy Chase: But with layering the chocolate wafers, I didn't know whether, how to put the wafers on the edge. You could put a full wafer down the middle, and then do you crack it in half and put it down the edges? Jessie: Yes, yes, exactly. Yeah, yeah, what I wrote is you cover as much of the cream as possible with a layer of wafers filling any gaps with broken wafers to create a solid layer. Suzy Chase: No, it was amazing and if you love coconut, you're gonna love this. Suzy Chase: So where can we find you on the web and social media. Jessie: Yes. Great question. So on the web I am at jessiesheehanbakes. That's my website where I have my blog and information about events that I'm doing and articles that I've written and the whole nine. Then on Instagram I'm at jessiesheehanbakes, same thing and same thing on Facebook and I have a Facebook page and I think Twitter is jessiesbakes. Suzy Chase: Great. Thanks Jessie for coming on Cookery By The Book podcast. Jessie: You're so welcome Suzy. I loved chatting with you. Suzy Chase: Follow me on Instagram at CookerybytheBook. Twitter is IamSuzyChase and download your Kitchen Mix Tapes music to cook by on Spotify at Cookery By The Book and as always subscribe in Apple Podcasts.